In this tutorial you will learn how to view your course analytics. It's possible to get a nice oversight that will show you how many days it takes your users to finish a course on average, what the total amount of pages learned is and what the average number of logins per user is. Step 2. Next, click on the gear-icon in the top left corner of the desired course and click on 'Analytics' in the menu that will show up. Step 3. Select the duration at the first dropdown menu. You can choose between: 'Last 3 months', 'Last 30 days' and 'Last 7 days'. Step 4. Select the group that you want to analyze in the second dropdown menu. Congratulations! 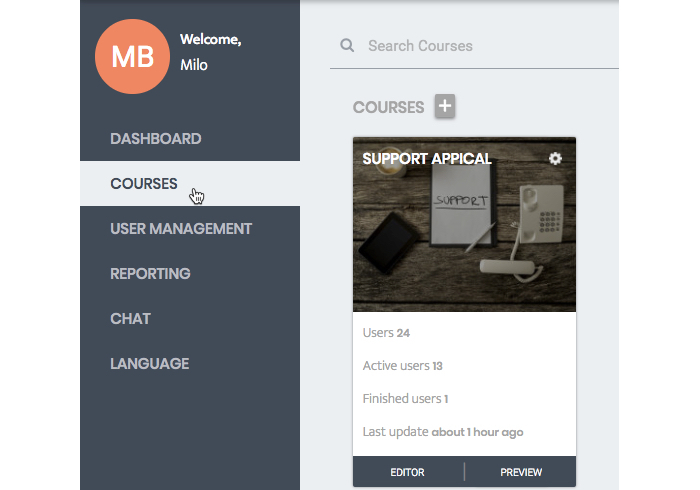 You now know how to view your course analytics!